Sadly, another narrow loss last night to the Kensington Wanderers @ Chiswick where Ralph lost the toss leading to us being inserted (ooer Mrs...). A quick start from Mike and Abhishek A (new find via NJ) led to us making good progress with Mike duly retiring having reached his 25. NJ came in carrying on at a good rate before being caught behind trying to press on. Chairman Westhead was next in for his seasonal debut, who took some time to acclimatise to the conditions whilst also facing the oppo's best bowler, Tom. A good deal of leaving outside off stump ensued with Guy eventually sacrificing himself via a typically farcical Dodgers run out... Notable contributions were then made from Phil and Rene lower down who saw us get to 20 overs for 123 which all things considered was a decent effort against a strong bowling attack. Turning to our own bowling, we opened with Abhishek C (NJ + 2) who bowled a lovely opening spell of sharp medium both on and just outside off stump. JH toiled from the other end but following his near Michelle last week, I fear we may have broken him (or maybe he’s just getting old) as a shoulder complaint meant he could only throw down 3 of his usual 4 overs. 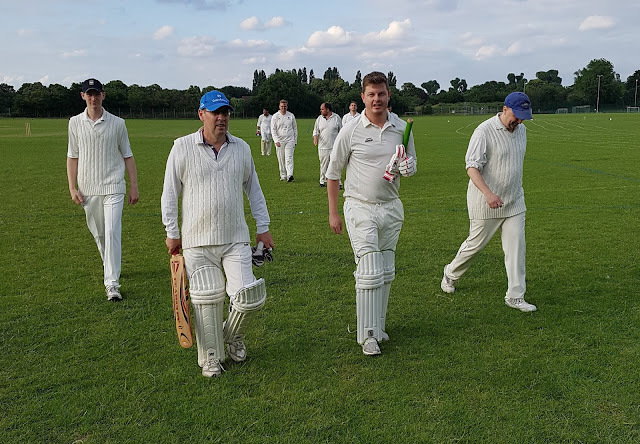 Further excellent spells from both Rene and Adam were appreciated which kept the opp's run rate in good order, Adam was particularly unlucky not to strike having consistently beat the outside edge. I then turned to my own bag of liquorice, which was as it sounds, albeit a little better than previous efforts this season, but did result in 2 in 2 balls (don’t like to talk about it). This left NJ to bowl the final over defending 6 runs. A good start to the over was somewhat compromised by an very uncharacteristic no ball and a couple of further slogs saw the Wanderers home with a couple of balls to spare. All in all an excellent game on what turned out to be a nice sunny evening and a much closer result than the first game against Kensington a few weeks ago, where we were comfortably beaten, so, progress of sorts etc and we move on to next week.